The IEWG has been founded by a group of veterinarians and dog breeders in Davis, CA, U.S.A. in 1989 with the aim to increase the knowledge on and awareness of elbow disease in dogs, and to support all stakeholders in disseminating new knowledge in this field. 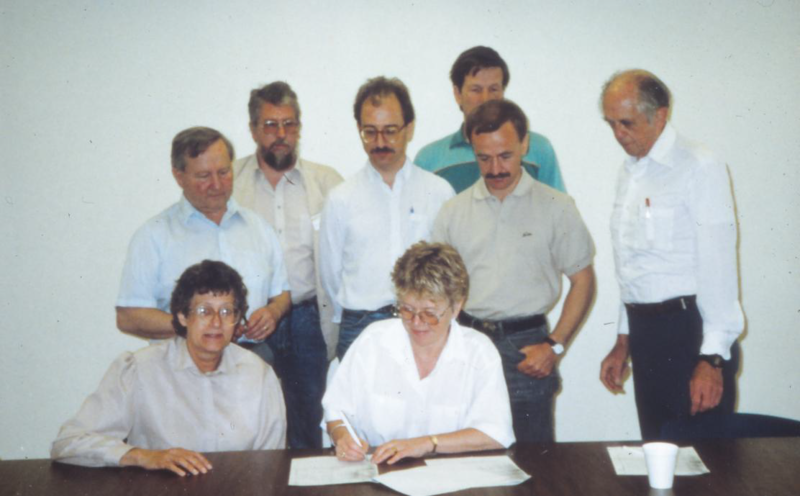 Founding meeting of the International Elbow Working Group in Davis (CA) in 1989. It was the presence of elbow dysplasia in the Bernese Mountain Dog that led Dr Packard and his wife Barbara to enlist the help of Dr. Alida Wind, radiologist from the Veterinary College of Davis (CA), which eventually led to the formation of the formation of the IEWG. Dr. Wind organised the first meeting of the IEWG for orthopaedic surgeons, radiologists and geneticists from around the world active in ED-research, as well as concerned dog breeders in Davis at the University of California. In order to completely understands the cause of ED it would be necessary for the IEWG to meet annually and include any researchers whom are interested in ED. ED consists of four entities, i.e., osteochondrosis of the medial humeral condyle, ununited anconeal process, fragmented coronoid process, and elbow joint incongruity. An evaluation scheme for the interpretation of elbow radiographs should be established, and the international protocols for evaluation and diagnosis of ED should be evaluated and revised by the IEWG annually. At this web site you can read the follow-up of these original conclusions.